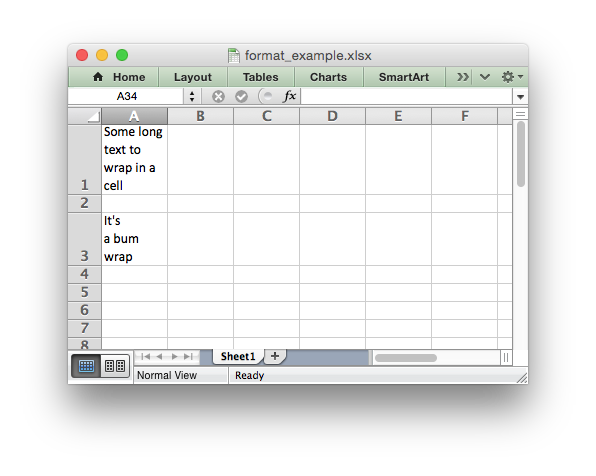 This section describes the methods and properties that are available for formatting cells in Excel. The properties of a cell that can be formatted include: fonts, colors, patterns, borders, alignment and number formatting. cell_format1 = workbook.add_format()       # Set properties later. cell_format2 = workbook.add_format(props)  # Set properties at creation. In general the key/value interface is more flexible and clearer than the object method and is the recommended method for setting format properties. However, both methods produce the same result. 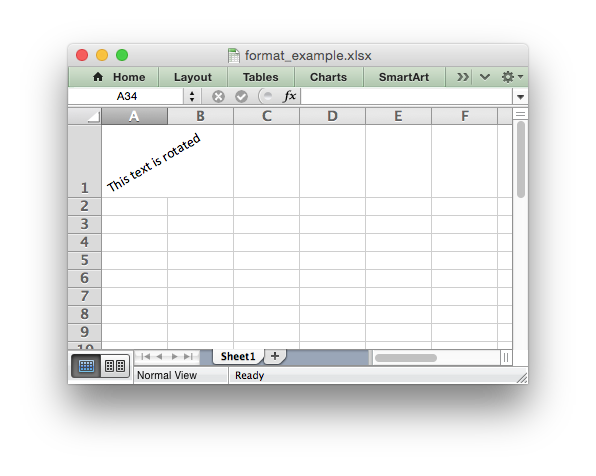 The default Excel 2007+ cell format is Calibri 11 with all other properties off. cell_format.set_bold()      # Turns bold on. cell_format.set_bold(True)  # Also turns bold on. cell_format.set_bold(False)  # Turns bold off. Cell A1 is assigned a format which initially has the font set to the color red. However, the color is subsequently set to green. 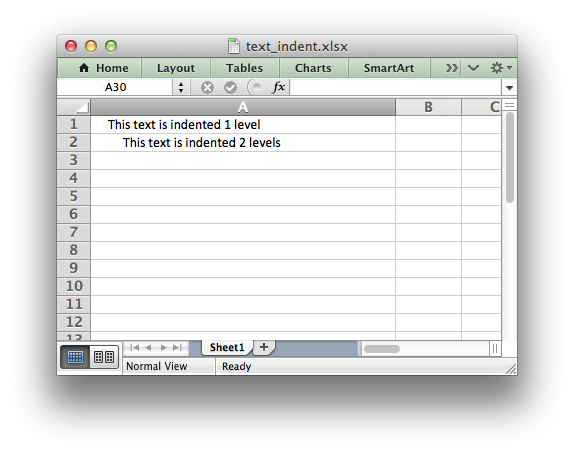 When Excel displays Cell A1 it will display the final state of the Format which in this case will be the color green. The format properties and methods are explained in the following sections. Set the font used in the cell. fontname (string) – Cell font. Excel can only display fonts that are installed on the system that it is running on. Therefore it is best to use the fonts that come as standard such as ‘Calibri’, ‘Times New Roman’ and ‘Courier New’. 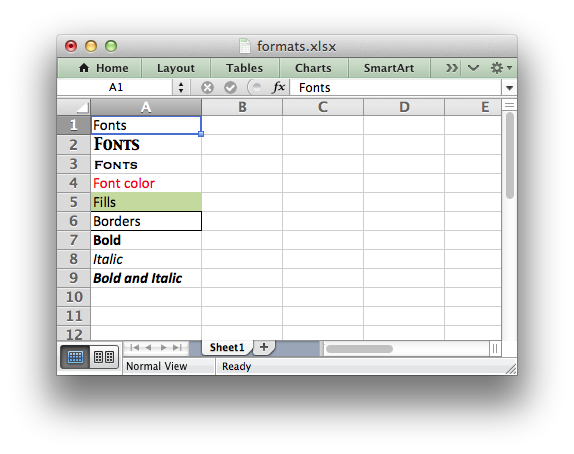 The default font for an unformatted cell in Excel 2007+ is ‘Calibri’. Set the size of the font used in the cell. size (int) – The cell font size. Excel adjusts the height of a row to accommodate the largest font size in the row. You can also explicitly specify the height of a row using the set_row() worksheet method. Set the color of the font used in the cell. color (string) – The cell font color. The color can be a Html style #RRGGBB string or a limited number of named colors, see Working with Colors. Note: The set_font_color() method is used to set the color of the font in a cell. To set the color of a cell use the set_bg_color() and set_pattern() methods. Turn on bold for the format font. Turn on italic for the format font. Turn on underline for the format. style (int) – Underline style. Set the strikeout property of the font. Set the superscript/subscript property of the font. This property is generally only useful when used in conjunction with write_rich_string(). Set the number format for a cell. format_string (string) – The cell number format. This method is used to define the numerical format of a number in Excel. It controls whether a number is displayed as an integer, a floating point number, a date, a currency value or some other user defined format. cell_format1.set_num_format('d mmm yyyy')  # Format string. The number system used for dates is described in Working with Dates and Time. For more information refer to the Microsoft documentation on cell formats. Numeric formats 23 to 36 are not documented by Microsoft and may differ in international versions. The listed date and currency formats may also vary depending on system settings. The dollar sign in the above format appears as the defined local currency symbol. Set the cell locked state. state (bool) – Turn cell locking on or off. Defaults to True. # This cell cannot be edited. # This cell can be edited. Hide formulas in a cell. Set the alignment for data in the cell. alignment (string) – The vertical and or horizontal alignment direction. Text can be aligned across two or more adjacent cells using the 'center_across' property. However, for genuine merged cells it is better to use the merge_range() worksheet method. The 'vjustify' (vertical justify) option can be used to provide automatic text wrapping in a cell. The height of the cell will be adjusted to accommodate the wrapped text. To specify where the text wraps use the set_text_wrap() method. Center text across adjacent cells. Text can be aligned across two or more adjacent cells using the set_center_across() method. This is an alias for the set_align('center_across') method call. For actual merged cells it is better to use the merge_range() worksheet method. Wrap text in a cell. 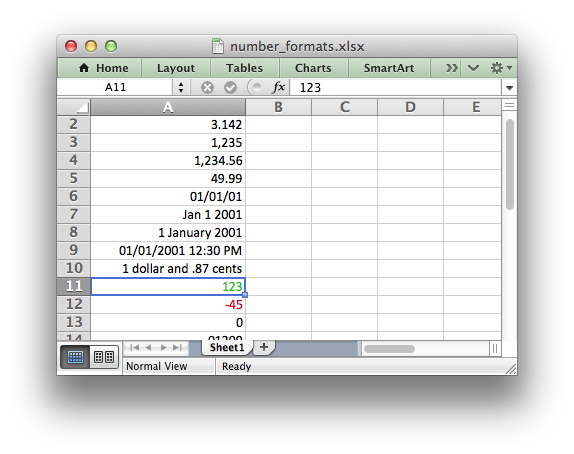 Excel will adjust the height of the row to accommodate the wrapped text. A similar effect can be obtained without newlines using the set_align('vjustify') method. Set the rotation of the text in a cell. angle (int) – Rotation angle in the range -90 to 90 and 270. The angle 270 is also supported. This indicates text where the letters run from top to bottom. Set the reading order for the text in a cell. direction (int) – Reading order direction. Set the text reading direction. 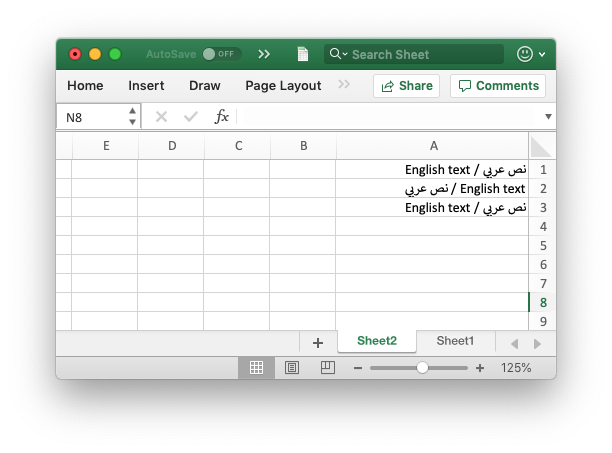 This is useful when creating Arabic, Hebrew or other near or far eastern worksheets. It can be used in conjunction with the Worksheet right_to_left() method to also change the direction of the worksheet. worksheet.write('A1', u'نص عربي / English text')  # Default direction. Set the cell text indentation level. level (int) – Indentation level. Indentation is a horizontal alignment property. It will override any other horizontal properties but it can be used in conjunction with vertical properties. Turn on the text “shrink to fit” for a cell. Turn on the justify last text property. Only applies to Far Eastern versions of Excel. index (int) – Pattern index. 0 - 18. Set the background pattern of a cell. The most common pattern is 1 which is a solid fill of the background color. Set the color of the background pattern in a cell. The set_bg_color() method can be used to set the background color of a pattern. Patterns are defined via the set_pattern() method. If a pattern hasn’t been defined then a solid fill pattern is used as the default. cell_format.set_pattern(1)  # This is optional when using a solid fill. Set the color of the foreground pattern in a cell. The set_fg_color() method can be used to set the foreground color of a pattern. Set the cell border style. style (int) – Border style index. Default is 1. A cell border is comprised of a border on the bottom, top, left and right. These can be set to the same value using set_border() or individually using the relevant method calls shown above. 4 Dot 1 . . . . . .
9 Dash Dot 1 - . - . - . 10 Dash Dot 2 - . - . - . 11 Dash Dot Dot 1 - . . - . .
12 Dash Dot Dot 2 - . . - . .
13 SlantDash Dot 2 / - . / - . 0 None 12 - . . - . .
7 ----------- 13 / - . / - . 4 . . . . . . 10 - . - . - . Set the cell bottom border style. Set the cell bottom border style. See set_border() for details on the border styles. Set the cell top border style. Set the cell top border style. See set_border() for details on the border styles. Set the cell left border style. Set the cell left border style. See set_border() for details on the border styles. Set the cell right border style. Set the cell right border style. See set_border() for details on the border styles. Set the color of the cell border. color (string) – The cell border color. Set the color of the cell borders. A cell border is comprised of a border on the bottom, top, left and right. These can be set to the same color using set_border_color() or individually using the relevant method calls shown above. Set the color of the bottom cell border. See set_border_color() for details on the border colors. Set the color of the top cell border. Set the color of the left cell border. Set the color of the right cell border. Set the diagonal cell border style. Set the style for a diagonal border. The style is the same as those used in set_border(). 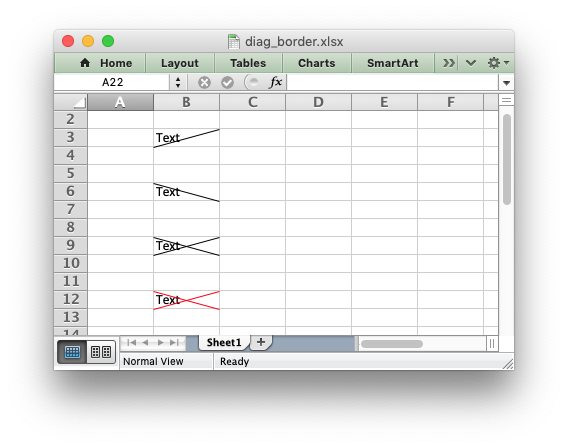 See Example: Diagonal borders in cells. Set the diagonal cell border type. style (int) – Border type, 1-3. No default. From bottom left to top right. Same as type 1 and 2 combined. Set the color of the diagonal cell border.